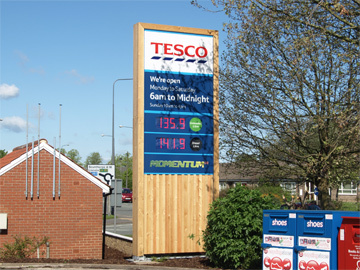 We are pleased to announce that Bennetts Timber has been selected by one of their customers to provide Siberian larch Timber Cladding to Tescos for use on their garage 'totems' across the UK. Siberian Larch timber cladding is made from high density softwood which is highly durable and is generally used for external cladding and has a life expectancy from 50-100 years exposure. Siberian Larch timber cladding has a fantastic depth of colour which varies from a striking light yellow, through rich oranges to a golden brown in the heartwood. This fantastic appearance, combined with its high durability makes Larch timber cladding an ideal choice. Edward Bennett, managing director said "We are delighted to supply one of our customers with our Siberian Larch who are fabricating and installing garage totems to Tescos stores all over the UK. This order confirms that the quality offered by our state of the art milling facility is being recognised by customers across the UK"